Petraeus: 'Long, Hard Slog' In Iraq The top U.S. military commander in Iraq says the country has seen significant progress in the past year, but there are many tough miles ahead. This fall, he takes over as head of U.S. Central Command. U.S. Army Gen. David Petraeus talks to members of the Senate Armed Services Committee on May 22. 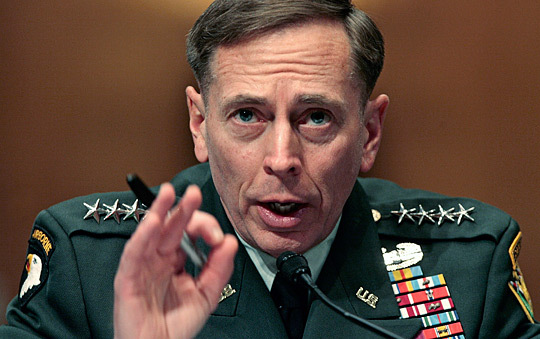 Gen. David Petraeus is nearing the end of his tenure as the top U.S. commander in Iraq. This fall, he takes over as chief of U.S. Central Command, where he will turn his attention to military operations in other parts of the region, including Afghanistan. Iraq has gone from "170 attacks a day, back about a little over a year ago, to an average of less than 25 a day right now," Petraeus tells Deborah Amos. But the country still faces security challenges, as well as political, economic and diplomatic difficulties. Petraeus says he discussed those changes and problems with Sen. Barack Obama when the Democratic presidential hopeful visited the country last week. In recent weeks, there has been much discussion of a timetable for troops to withdraw from the country. Obama and Iraqi Prime Minister Nouri al-Maliki have both recently talked about creating such a time frame. The White House, which once said there would be no timetable, is now talking about a "general time horizon." And Obama's rival, Republican John McCain, has said a timetable is "pretty good," if it's based on conditions on the ground. Petraeus says he remains focused on those conditions. "In another month or so, we can probably have an assessment that provides us the possibility of further recommendations on reductions. 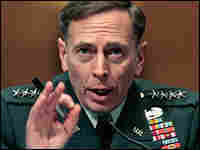 But again, we'll see how the conditions are at that time," Petraeus says. "Prime Minister Maliki has used the term 'conditions' in his session with Sen. Obama and the congressional delegation, as did his spokesman." Iraq's domestic politics clearly play a role in the discussion of a timetable, Petraeus says. "There is a very keen sense of desire to exercise sovereignty, and so there is a natural impulse," he says. "Also, by the way, it's not only an election year in the United States, it's an election year in Iraq, and, not unsurprisingly, certain political leaders and elements will criticize the incumbent government and use whatever angles they can. And one of those is certainly to challenge their assertion of sovereignty." Although the Iraqis have yet to set up provincial elections — seen as a key step in political reconciliation — Petraeus says the government has passed "some impressive legislation." Voter registration began on July 15. "This is a very difficult piece of legislation that they are now negotiating, the provincial elections law. While it's certainly everyone's hope that they will approve it at the end of the month, it is very, very fiercely debated," he says. "But it is democracy, or 'Iraqracy,' as some term it, and we are all keenly watching the debate." Officials in Washington have talked recently about the need for more troops in Afghanistan. Petraeus says those statements do figure into his calculations about Iraq. "The human cost and the financial cost and the strategic opportunity cost, if you will — the fact that forces are here, they can't be elsewhere — figures into the recommendations that I make," he says. "They are factors, so they do figure in, but they don't drive the recommendations." Petraeus once famously asked, "How does this end?" Five years after the start of the war, he says Iraq still has a difficult road ahead. "This has been a very long, hard slog, and there are many, many tough miles still to go. ... The reality is that Iraq has been hard, is hard and will continue to be hard. But it is a country in which there has been very significant progress."